The automatic TFT HANDLINE includes all conventional handline sizes in one. The wide flow range of 95-300 gpm (360-1150 l/min)includes operational pressure choices of 100 psi (7 bar), 75 psi (5 bar) and 55 psi (4 bar). This series is an excellent choice for 1.5"- 2.5” (38mm – 65mm) hose lines. 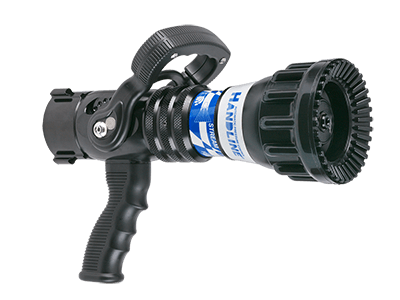 The HANDLINES feature flush without shutdown, "Gasket Grabber" inlet screen, molded rubber bumper with "power fog" teeth, TFT's patented stainless steel slide valve, detent flow control and optional colored pistol grip and handle covers. All TFT HANDLINES accept low- or multi-expansion foam attachments.